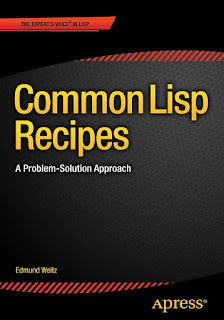 Edi Weitz, author of things like CL-PPCRE and Hunchentoot (amongst many other pieces of ediware), has just published a new book, “Common Lisp Recipes: A Problem-Solution Approach”. I've ordered mine. Get yours from Apress or a European Amazon store. 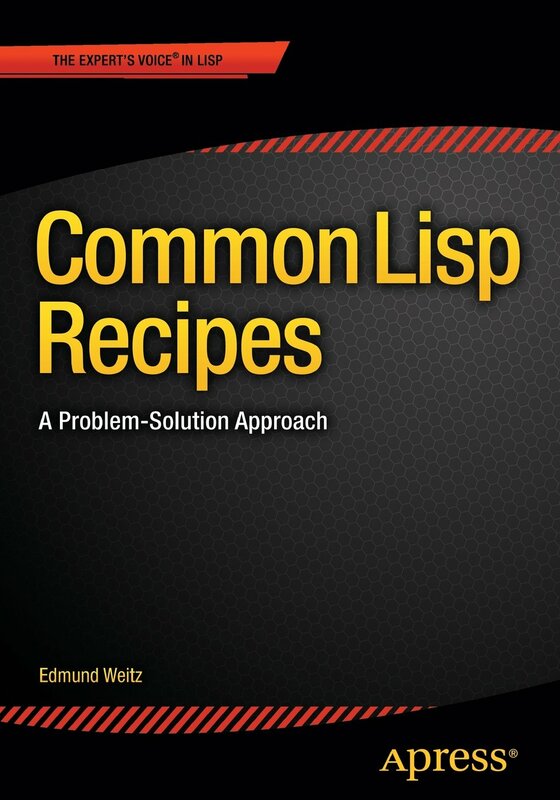 Common Lisp Recipes is a collection of solutions to problems and answers to questions you are likely to encounter when writing real-world applications in Common Lisp. Written by an author who has used Common Lisp in many successful commercial projects over more than a decade, this book is the first Common Lisp book which covers areas as diverse as web programming, databases, graphical user interfaces, communication with other programming languages, multi-processing, and mobile devices as well as debugging techniques and optimization, to name just a few. It is organized around specific problems or questions each followed by ready-to-use example solutions and clear explanations of the concepts involved, plus pointers to alternatives and more information. Each recipe can be read independently of the others and thus the book will hopefully earn a special place on your bookshelf as a reference work you always want to have within reach. Common Lisp Recipes is aimed at programmers who are already familiar with Common Lisp to a certain extent but do not yet have the experience you typically only get from years of hacking in a specific computer language. It is written in a style that mixes hands-on no-frills pragmatism with precise information and prudent mentorship. Thanks for letting us know, I have somehow totally missed the appearance of the book. Already ordered mine, too :).